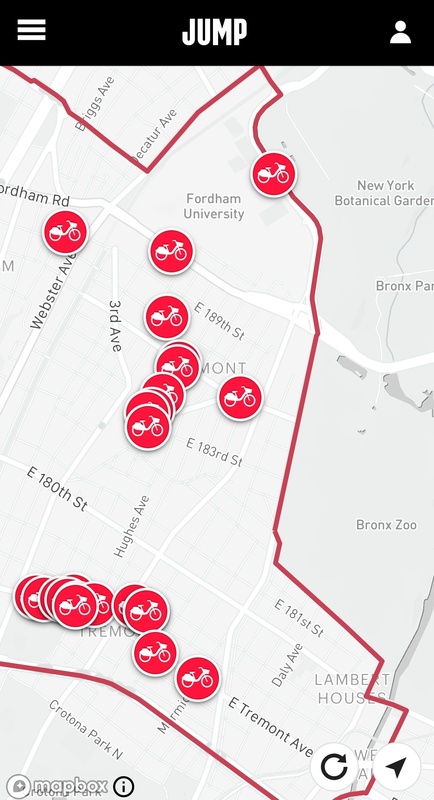 This morning DOT launched its dockless bike-share pilot in the Bronx, which figures to be the most interesting of the city’s four dockless bike-share zones. For one, the pilot area in the West Bronx, between Bronx Park and the Harlem River, includes very dense and walkable neighborhoods where bike-share can really take off and serve large numbers of trips. What’s more, the two bike-share companies operating in the Bronx are JUMP, which is owned by Uber, and Citi Bike, soon-to-be-owned by Lyft (the merger has yet to be completed and Motivate remains the parent company for the time being). In addition to serving as a proxy for the rivalry between the two ride-hailing companies, JUMP and Citi Bike produce bicycles that are widely viewed as two of the sturdiest and most durable models on the market. 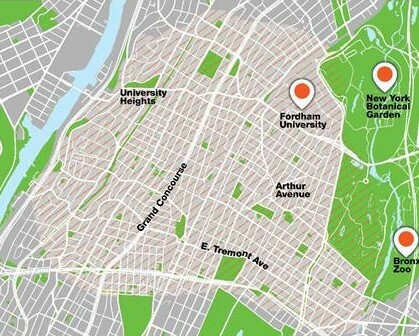 These two services are strong bets to expand in NYC after the initial pilot phase. And of course, dockless Citi Bikes have the potential to integrate with the existing Citi Bike service area and quickly expand the reach of the nation’s largest bike-share system. Dockless Citi Bikes are not available yet, however. The company will launch its service in the Bronx pilot area by “mid-August,” DOT announced today at a press event at Tremont Park. Meanwhile, 200 JUMP pedal-assist electric bikes are now available. A JUMP rental currently costs $2 for the first 30 minutes, with a 7-cent fee for every additional minute. Unlike Motivate’s dockless bikes, which are free-standing, JUMP users must lock the bikes to racks or sign posts. Once Motivate deploys its 200 bikes, they’ll be available as part of all Citi Bike subscriptions. People without a Citi Bike pass will be able to rent a bike for the company’s regular fees, which currently stand at $2 for every 30 minutes. Unlike station-based Citi Bikes, which are unlocked using a key-fob, the dockless bikes will require a mobile app to ride. During the pilot period, Citi Bike and JUMP users will not be able to take their bikes outside the designated boundary. 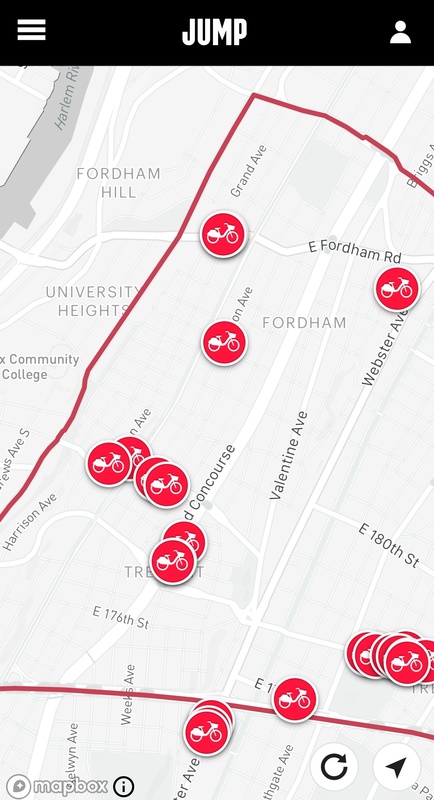 So while Citi Bike has officially “come to the Bronx,” the borough is still not connected to the company’s 12,000-bike station-based network. Motivate says it’s aiming for interoperability and integration with the larger Citi Bike system. “That is absolutely the goal, that everything will link up. You’ll have one Citi Bike, use it everywhere in the city, and it will be, effectively, fit-for-purpose in each area,” said CEO Jay Walder. But for now, because the pilot is not adjacent to the existing Citi Bike area and the dockless bikes can’t be parked at stations, the Bronx zone is effectively a separate network from the main Citi Bike service. Citi Bike joined the Bronx pilot on short notice, after Chinese company ofo significantly scaled back its North America operations and backed out. Citi Bike had previously been set to participate in the dockless bike-share pilot in Coney Island, which is slated to launch later this year, but now the companies in that zone are to be determined. 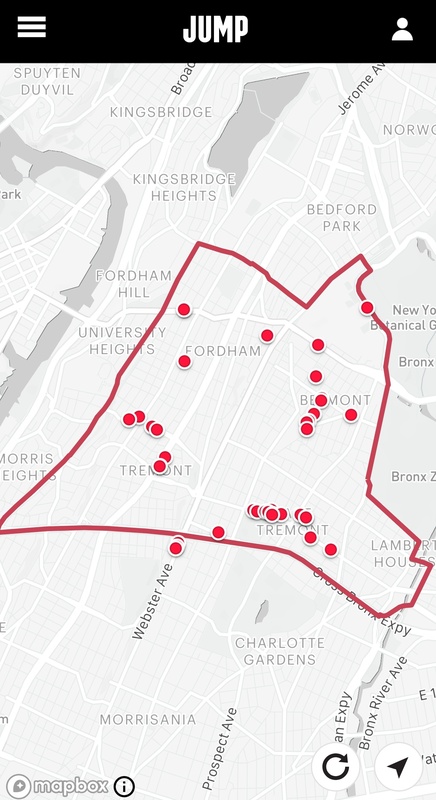 While New Yorkers are getting a taste of bike-share in neighborhoods that didn’t previously have it, none of the pilot zones are large enough or include enough bikes to generate use by large numbers of people. Until the city has bike-share services with tens of thousands of bikes deployed across large, contiguous geographic areas, its bike-share networks won’t be as useful as they should be. It remains unclear when the city will switch from the pilot phase to a genuine expansion of bike-share. Last year, City Hall and Motivate were on the verge of signing a deal to expand Citi Bike by 50 percent, with two-thirds of the new bikes going to areas outside of the current Citi Bike service zone. The deal would have allowed Citi Bike to expand without city funding. In exchange, the city would have waived fees for bike-share stations that occupy former metered parking areas. Mayor de Blasio reportedly balked at the deal because expansion would entail converting curbside parking spots to bike-share stations. 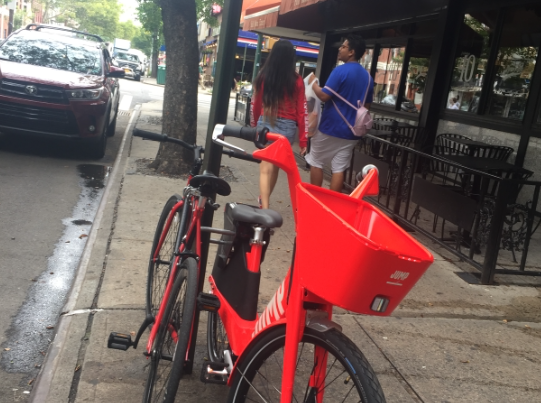 Today, DOT Commissioner Polly Trottenberg said the city had opted to test out dockless bike-share because it could be deployed “more nimbly” than station-based systems, which she said trigger a “pretty complex community board process” that often devolved into arguments about the repurposing of parking spots. Correction: An earlier version of this post said Citi Bike will participate in the Coney Island dockless bike-share pilot. That had been the plan before ofo backed out of the Bronx pilot, but now the city may select different companies for Coney Island. The post has been amended. If the Staten Island Express Bus network redesign is any indication, the Bronx bus network redesign (the next one under Andy Byford’s Fast Forward plan) will eliminate dozens, if not hundreds, of bus stops around the borough. Why not re-purpose those as bike share parking? No community board approval required. Dismantle the technology and you have a free bike. Or, just pilfer for the parts. The bus stops may not be the best locations for bike share. And the community boards will always complain. The Bronx is more receptive to non-automotive based street changes though than Brooklyn and Queens though. Community board approval is not required for anything. Community boards are un-elected, unofficial and unnecessary advisory panels. They’re comprised of NIMBYs and cronies of the elected city council members, and the same cranks sit on those boards for years and decades. They say no to almost everything, and DOT likes to use it as an excuse for inaction. I hope that JUMP is popular enough to expand their service zone in the Bronx soon. I rode one this morning and had a great time zooming up and down the hills, but their zone ends about 10 big bronx blocks north of my house.